THE BLEACHER BRIEFINGS: Will Old Man Winter Claim Super Bowl MVP? Will Old Man Winter Claim Super Bowl MVP? The Super Bowl is just over a week away, and while there is plenty of discussion about the two teams who will play, there may be even more talk about the potential MVP of the game; Old Man Winter. 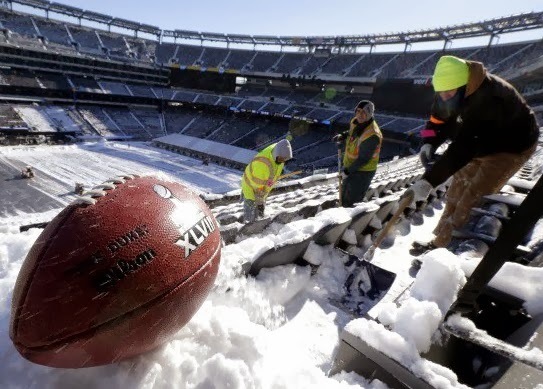 A rather large winter storm blanketed the New York/New Jersey area this week, and the talk is "what if" this type of thing happens on February 2nd, when the Denver Broncos and Seattle Seahawks square off to decide the best team in the NFL? East Rutherford, home to MetLife Stadium where the game will be played, is already a traffic nightmare, but if you add a foot of snow, what then? Never fear. A contingency plan has been in place since the NFL boldly chose to play for the first time ever in a cold weather city, in an open-air stadium, in early February. There are extra snow plows, front-end loaders, dump trucks full of salt and extra salt-spreaders, and about 1,600 city and state road workers on call for next Sunday's contest. There have been Super Bowls in cold weather cities, but all have been in domes previously. This one, should Mother Nature decide to play one of her funny little tricks, could be really, really interesting. I'm probably in the minority when I say this, but I hope it's borderline blizzard conditions. To me, that's the way football should be played. The Ice Bowl (the NFL Championship Game to decide who would play the AFL Champion in Super Bowl II), was played in Green Bay on New Year's Eve, 1967, between the Packers and Dallas Cowboys. It's still one of my favorite games of all time, and many have called it the greatest game ever. I was only 6-years-old at the time, so to say that I remember everything about that game would be a lie. But I do remember it, and watching in amazement as the teams met in -15 degree temperatures. The wind chill was almost 30 degrees colder than that. As a young boy from Alabama, my brain couldn't fathom those temperatures. I had no idea how the players could even breath out there, much less play in that. But even then, they had technology to make the conditions playable (allegedly). Lambeau Field had a turf-heating system that was supposed to keep the ground from freezing. Unfortunately, it somehow malfunctioned, and when the tarp was removed from the field, there was excess moisture that immediately froze, making the surface more conducive for the Stanley Cup Final than the NFL Championship Game. As day turned to night, temperatures were recorded as low as -20 and wind chills as low as -70 degrees. The game was highlighted by a last minute, game-winning drive in the frigid temperatures by Packer quarterback Bart Starr, culminating when Starr, with no time outs left and the clock running out, defied logic and wisdom and ran a quarterback sneak rather than a pass on 3rd and goal from the one. An incomplete pass would've given them time for a game-tying field goal and overtime, but Starr and head coach Vince Lombardi opted to go for the win, and succeeded, 21-17. Being from Montgomery and having played college ball for the Crimson Tide, Starr was a hero for many of us fellow Alabamians. That game cemented his legacy, as he went on to win his second Super Bowl title a few days later. I can't help but wonder, if the weather turns out to be a factor in this year's Big Game, could another classic be in the offing? Could a last second drive by Peyton Manning, who has always reminded me a lot of Starr, deliver a game-winning play late for a thrilling and memorable victory? Only time will tell. I'm just hoping that they get a chance to play in adverse conditions for the biggest championship in sports. I'm pulling for the snow. But I can't help but wonder, will there even be many fans in the stadium if the temperatures are frigid and the snow runs deep, or will this generation opt for a local sports bar or to just stay at the house and watch on their 70-inch plasma TV? The biggest part of the people who attend the Super Bowl now are celebrities and/or individuals with money to burn, not the true die-hard fans. Tickets have become so hard to land that it looks more like the red carpet on Oscar night at most of the recent games. Who knows, maybe icy temps and mounds of snow will be just what it takes to get some real fans in the stadium. Wish I was one of them. I'm with you. Hope it snows a foot on game day and all throughout the game as well. This was such a stupid idea from the get go. Weather shouldn't be a deciding factor in a game of this magnitude. For Denver's sake they better hope its not all snowing with strong wind gusts and things of that nature. Peyton will blow it if that's the case.